2KM entry into the electrically operated metering systems gets many years application knowledge from the process Flow Mix where servo driven actuators operate the metering pumps to give a quiet running clean metering system for clean room applications. The metering pumps are constructed from stainless steel and are directly coupled to the linear actuators ensuring a long work life. 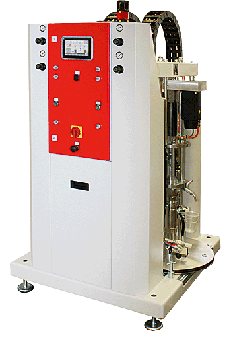 The use of servo drives allows the system to hold the pressure and not be driven by the metering system. Feedback loops give the system positional information and hence ratio monitoring.